The Toronto debut by Australia's Hatchie wasn't supposed to happen this way. Originally the 25-year-old from Brisbane was scheduled to perform the following night at the much more spacious Danforth Music Hall, opening for Belle & Sebastian. However, that tour was cancelled almost as soon as it was announced and Hatchie found herself on a headlining tour. 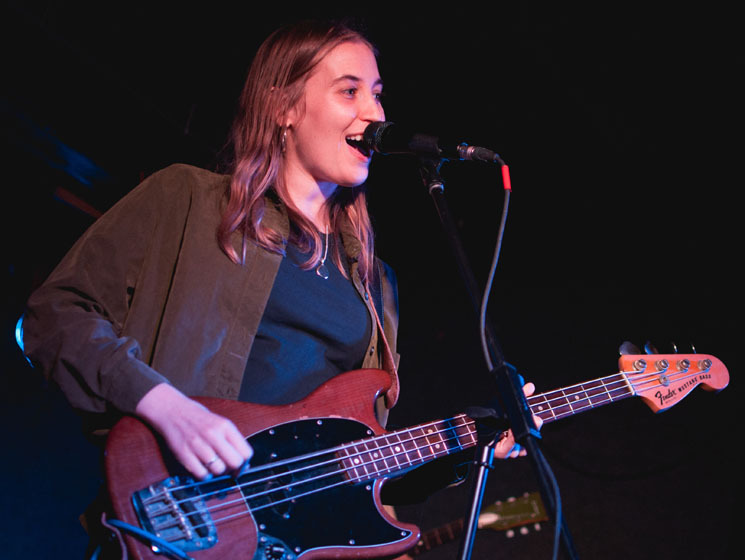 But over the past few months, Hatchie had been generating some serious buzz, and so there weren't too many fans complaining about the downsizing to a more intimate venue. Riding the glowing reviews of her recent debut EP, Sugar & Spice, Hatchie (aka Harriette Pilbeam) expanded to a compact four-piece for the stage. When they first tried to get things going, they realized the battery for the acoustic guitar had died, delaying for a few minutes. They began with the title track from the EP, which tested their ability to recreate the bedroom dream pop of its recording. Immediately it became apparent that some of the studio's gauzy intimacy would be a little lost, despite an array of pedals surrounding them. Pilbeam, however, had no problem letting her voice soar and shimmer and her ability to match the EP's gorgeous melodies came across as effortless. During "Try," she demonstrated how she is a true heir to the heavenly choral work of predecessors Liz Fraser, Harriet Wheeler and Dolores O'Riordan. "I didn't think we'd be doing this a couple months ago, so thank you so much for coming," Pilbeam expressed, adding they had spent the day visiting Niagara Falls and "all the hot spots." For "Sleep" they relied on backing tracks for some layers, but they added the synthesizer for its chiming hook. Only having an EP meant they needed to throw in a couple of new songs: "Adored" sounded like an obvious future single, and "Without A Blush," both of which indicated there is good stuff yet to come from Hatchie. When Pilbeam announced, "We only know seven songs so that means we have two more for you," it was a painful reminder that yes, Hatchie is only a year-old project that took off without any real expectations. They slowed things down with "Bad Guy," in which Pilbeam oozed with heartbreak. Some trouble tuning the other guitar slowed down the finale, but they got "Sure" up and running in no time to close the set on a high. "I'm hiring two new guitarists because these guys are fired," Pilbeam joked as they finished. This is all so new for Hatchie the band, but they did an admirable job. Because let's face it, translating these dreamy, delicate songs for the stage can't be an easy task.